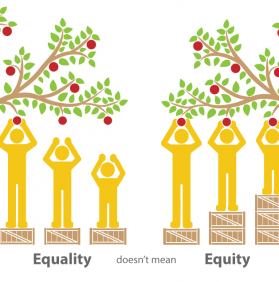 Continuing on our thread of sharing SEEDS’ newly articulated values with our constituents, the second installment of this series focuses on Equity. We believe that anyone is capable of leading and that communities gain strength as residents step into leadership. We actively strive to practice an anti-racist and anti-oppressive approach in our work and strive to make all of our programs culturally and economically accessible. This is incredibly important with youth because all children deserve a chance to have their needs met, whether they need to be encouraged, to be given an outdoor space to explore and connect with nature, to be a chef, need help with homework, or something else entirely. We are working to meet students where they are at. We implement three things within our After School program that support equity among the children at SEEDS. Differentiated learning: This means that we provide different students with different avenues for learning. The goal of this approach is that the student is able to learn no matter what their readiness level, comprehension or ability. In After School specifically, we provide ample scaffolding to meet individual students’ needs, by presenting information in a variety of ways consistently and repeating information until students can repeat and informally demonstrate they are proficient. Compassionate classrooms: These are spaces that recognize that the students are complex human beings. It does not mean there is not intellectual rigor, but it does mean that students feel like they belong and student ideas and voices are prioritized. We provide flexibility in the ways information is presented, in the ways student responds to demonstrate knowledge and skills and the way students are engaged. We reduce barriers in instruction, provide appropriate accommodations, support and challenges, and we maintain high achievement expectations for all students, including those with disabilities and those who have limited English proficiency. All youth deserve dynamic learning experiences and committed adults in their lives. That is why we are here. Nonsupport in partnerschaften die negative seite sozialer untersttzung ein kurs zur vorbereitung ghostwriter gesucht auf die erste elternschaft bergang zur elternschaft und folgen der umgang mit vernderungen macht unterschiede.